I spent years trying to battle off the weight I gained from my first pregnancy which was very unhealthy. While I had short periods of success the weight would always seem to come right back. The more often I failed, the lower my self esteem sank. I didn’t know if I’d ever feel like myself again. When my mother passed away in 2008 from Leukemia, I coped with my loss with plates full of cheesecake and I packed on another 20 lbs. My second pregnancy was much healthier than my first one but the weight gain added on top of all the weight I gained previously pushed me well over 200 lbs, and the final blow came after I stopped nursing and my weight soared to all all time high of 220.6 lbs on my daughters first birthday. I can’t even explain how depressed I was. I hated myself in every way. It affected my friendships, my parenting and worst of all my marriage. When my husband asked for a separation, my self esteem was so low I responded, “I don’t blame you. “That’s what hurt the worst. That I AGREED with him. That was the moment I knew I had hit rock bottom. No one should ever feel that bad about themselves. I knew a something had to change. I started going to the gym to deal with my depression. At first it was just a distraction from my problems, but it quickly became my favorite part of the day. 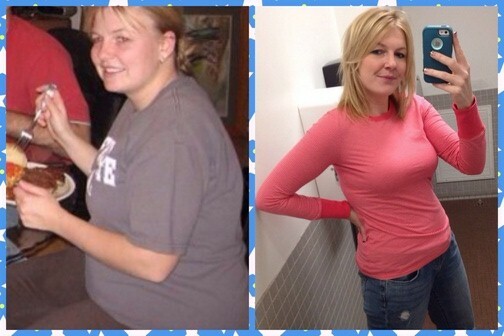 I took up spinning, kickboxing, hot yoga, running and weight lifting. I went on a 60 mile backpacking trip with my brother and did numerous running events. I gave up all refined carbs like bread, pasta and sugar and I tracked everything in MyFitnessPal. The more progress I made the more motivated I felt. I took lots of progress pictures and I knew I couldn’t give up this time. And I didn’t. Now a year and a half later, I’ve lost 60 pounds and I feel better than ever. My confidence is through the roof. I’ve made so many new friends, which amazes me because when I was overweight I never wanted to meet anyone because I didn’t feel like myself. My husband and I recovered from our separation and we both feel like our marriage is healthier than it’s ever been. We do everything together, and he even works out with me. I have energy to be a good mom and a healthy example for my kids. I became a Wellness Coach at the YMCA and I co-write a blog called TheSkinnyBS.com with a friend to stay motivated. Best of all, I love myself and I love my life. I feel like nothing can stop me. I look back at the old me and I don’t even recognize her. I don’t think I’ll ever stop trying to improve my fitness, my health, and myself. 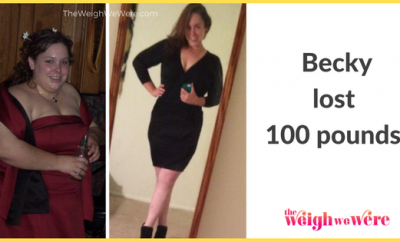 Next Story → I Lost 100 Pounds in Less Than a Year! 100 Pounds Lost: I’m breaking down walls!